On February 22, 1943, Sophie Magdalena Scholl, former student of philosophy and biology at the University of Munich in Germany, was executed by guillotine for her role in the White Rose nonviolent Nazi resistance group. Scholl was born just 21 years earlier and spent a carefree childhood in Ludwigsburg and later, in Ulm. Although she initially joined Bund Deutscher Mädel at age 12 (as required), she quickly grew disenchanted with the group and began to identify strongly with the dissenting political views of some of her teachers, family, and friends. While serving the required six months in the National Labor Service prior to enrolling in university, Scholl began exploring the philosophy and practice of passive resistance, which she was almost immediately able to put into practice at the University of Munich the following spring, where she quickly fell in with the compatriots of her older brother, Hans Scholl. Initially a forum to entertain the abstract questions of budding young intellectuals, the group (which dubbed itself the White Rose) quickly moved towards taking a more active role in resistance to the Nazi regime. How should an individual act under a dictatorship? What obligations, or indeed, power, did a group of half a dozen students have in the face of such stifling repression? As Sophie and her brother watched as their father was jailed for a critical remark made about Hitler to an employee, other group members shared stories of atrocities witnessed during war service (of the six members, all but Sophie were male). It was agreed that some sort of action was necessary. But what? Passive was their philosophy, but their language was most certainly not. In February 1943, the group targeted the last of the series of six leaflets for distribution in the main building of the university. Scholl and her brother volunteered to distribute the leaflets one morning, and nearly were able to disappear into the throng of students once classes let out, before being spotted by a janitor and quickly arrested. After hours of interrogation, Scholl had almost established her innocence, until investigators searched the siblings’ apartment and found proof of her guilt. At this point, she switched tactics and proudly stood by her actions, stating that she was obligated to act in accordance with her conscience and would freely do the same thing again, and this in the face of increasingly hostile and derogatory questioning by her interrogator. Indeed, the pamphlet that led to Scholl’s death did have that very effect. Smuggled out of Germany later that year, the Allied Forces seized on it and dropped thousands of propaganda copies German cities later that year, retitled as “Manifesto of the Students of Munich”. In the post World War II era, the Geschwister Scholl (Scholl siblings) have since attained an almost mythical stature in German culture and history, with numerous monuments and schools dedicated in their honor (as well as the famous University plaza the siblings crossed the day of their arrest). In a nationwide 2003 poll, Sophie and her brother Hans were voted the fourth most important Germans of all times, above Bach, Goethe and Einstein. 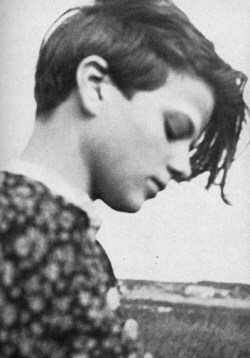 A celebrated movie about Sophie Scholl was released to critical acclaim in 2005, and the White Rose continues to be the subject of numerous books and articles, from the philosophical to the startlingly practical and pertinent questions of the present day, of just what an ordinary and relatively powerless individual can and should do under extraordinarily trying circumstances. 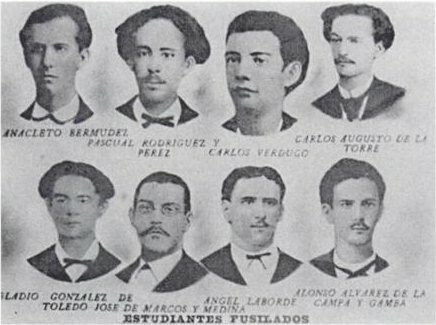 On this date in 1871, eight first-year medical students, aged 16 to 19, were shot in Havana Place de la Punta by Spanish colonial authorities in one of the most notorious episodes of that island’s independence struggle. Cuba was three years into the Ten Years’ War, the first of three major 19th century insurrections that would eventually throw off Spanish rule, but popular support for independence was far from universal. This book is the English translation of the classic Cuban text written by their schoolmate. A vocal pro-Spanish element opposed the rebels to the extent of mobilizing right-wing volunteer goon squads to rough up demonstrators and menace the government into dealing with them only at bayonet-point … proto-brownshirts, albeit from a more well-heeled class position. The Volunteers would make themselves felt this day. The editor of that Volunteer paper La Voz de Cuba was assassinated in 1870. The fatal accusation against the students was that they had desecrated the grave of that editor. In Cuba in 1871, vandalism with the wrong politics was good enough to get you shot … four days after the supposed crime. In that environment, it’s practically beside the point that one of the eight wasn’t even in town at the time and the “desecration” was so exaggerated (the link is a Spanish backgrounder) as to be essentially fabricated. The procedural rigging dignified with the word “trial” wasn’t going to get hung up on that detail, but it was also on the verge of an acquittal or a light sentence when a Caribbean Brooks Brothers riot steamrolled it (Spanish again) into sentencing eight to death and most of the others to significant prison terms. Defense attorney Frederico Capdevila alone distinguished himself (more Spanish) at this circus with an indignant and energetic defense, despite being attacked at one point by the Volunteer mob. At its appalling conclusion, he drew his sword and theatrically broke it over his knee — a gesture of contempt for the military tribunal that cost him his military career and made his reputation to posterity. 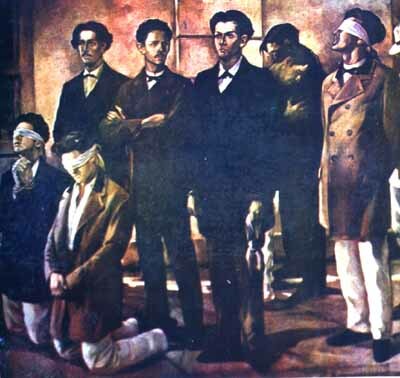 Radical writer Jose Marti, 18 years old at the time of this execution, summoned the image frequently and helped raise 27 Noviembre de 1871 into an enduring emblem of the worst of colonialism.